If you are homeowner with septic tank serving your property and experiencing problems with odour, septic tank flooding, drains backing up towards the property, or soakaway failure; we can help resolve your septic tank problem. 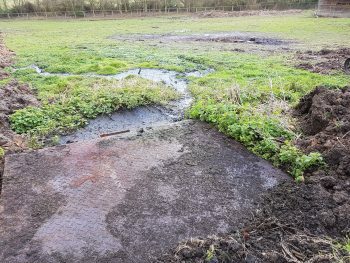 If your septic tank is overflowing to ditch or stream causing pollution to your local environment you should be aware under no circumstances a septic tank can discharge to watercourse. There are many variations of traditional septic tanks from design to building methods of brick structures or pre-casted rings. More modern types of sphere septic tanks are made from glass reinforced plastic (GRP) and the latest low profile septic tanks are made from high density polyethylene (Plastic). From our site inspection, we have seen septic tank problems associated with all types of septic tanks. Most common septic tank problem would be the soakaway failing causing the septic tank to flood and cause the drains to backing up towards the property. A septic tank becoming flooded can be for variety of reason from simple blockage of the transfer pipe from primary to secondary chamber, inlet or outlet T-pipe should also be checked for blockages, failing these simple checks we assume it could be more serious problem involving soakaway failure. Normally the wastewater within the septic tank will sit at level not hirer than the inlet T-pipe, the transfer pipe from the primary chamber to the secondary chamber should be visible and free flowing, outlet T- pipe should be visible flowing to outlet distribution chamber to soakaway. If the T-pipes are blocked it would need rodding to clear the blockage to resolve the drains backing up towards the property. If the transfer pipes are free flowing but the operation level of the septic tank is above normal we would assume the soakaway has failed. 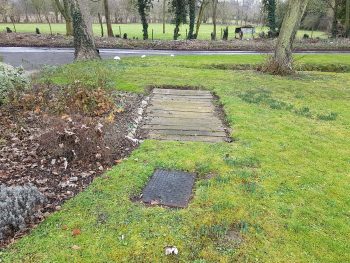 The signs of the problem are inspection lid lifting, waste water backing up from the septic tank towards the property, or land around the septic tank or soakaway to be wet, soft, or waterlogged. 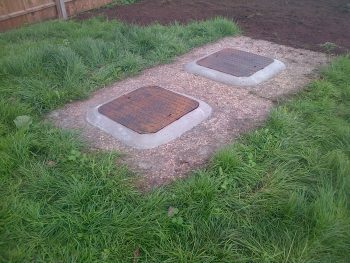 I would recommend to have the septic tank emptied while jetting the soakaway but most often the soakaway would need to be replaced to resolve the septic tank soakaway problem. There are many factors involved on septic tank soakaway lifespan due to being a natural process being reliant on the surrounding ground conditions and its ability to allow percolation. Some common examples would be root intrusion, high water table, poor ground conditions not allowing percolation, poor effluent quality can block the perforated pipework etc. We cannot accurately say how long soakaway lifespan will be specially on septic tank soakaway but would highly recommend maintaining your septic tank to make sure the soakaway life is not significantly reduced. We often find water table over recent years has risen causing soakaway problems. During wet periods of the year soakaways are more likely to fail because of the rising water table. Instead of the soakaway displace the effluent into the ground it has the reveres effect and acts as land drain. The soakaway problem could possible back drains up towards the property in the wet periods or even lift inspection lid when the septic tank is flooded in severe cases. Increase in volume of wastewater entering a septic tank can cause soakaway problems. A soakaway is designed for certain volume of water per 24 hours and if increased it could cause soakaway failure. If your property has extended over the years or was a cottage 30 years back it wouldn’t be surprizing if the soakaway is undersized, along with an undersized septic tank. Another reason could be the septic tank or soakaways was undersized by inexperienced tradesman. Sodium chloride found in washing powders and liquids, dish washer tablets, cleaning products, contains a lot of Salt. Excessive use of these products will cause soakaway lifespan to decrease and lead to soakaway failure. The process is called Sodium binding where the sodium is present causing silt / clay particles or both to bind together creating water proof barrier, prevent the soakaway to work efficiently. The same process occurs from water softener if fitted due to the soften water being high in sodium content. We would recommend to not over use washing powders, dish washer tablets, cleaning products excessively and not to fit water softeners to prevent sodium binding. Is your septic tank covered for repair or replacement under your building insurance? Most homeowners may not realise they are covered by their existing building insurance policy for off mains drainage such as septic tanks. You don’t need specific type of ‘septic tank insurance’ as most building insurance policy do cover septic tank problems or other damages to the off mains drainage system. The area of cover in building insurance policy is normally under ‘accidental damage to underground services’. It can be very confusing what you are covered for and we can point you in the right direction as we work alongside leading drainage insurance management company covering your area. We have overseen many different insurance claims for septic tanks, cesspits, soakaways, package sewage treatment plants, and many other off mains drainage problems. We would need to see your building insurance policy and find out more about the problem you are experiencing. If we think you have a claim, we can book site inspection for further investigation on your off mains drainage problem and manage everything on your behalf. The only cost you would have to cover is the excess due on the policy. Please contact the specialist on overseeing your off mains drainage insurance claim on 01206 890222 or completing our website submission form below. Most common type of septic tank failure can be related to the T-pipe falling away from the inlet pipe within the septic tank. The T-pipes are made from clay wear which are very heavy and are prone to come loose and are often found at the bottom of the septic tank when emptied. It’s important the T-pipe is always in place on the outlet of the septic tank to prevent any solids passing over to the septic tank soakaway and significantly reducing the lifespan of the soakaway. Traditional built septic tanks with brick construction they are prone to leak allowing groundwater to enter the off mains drainage system. Any additional flow rate such as roof water, surface water, or groundwater entering septic tank would not allow the correct time for solids to settle before passing over to the soakaway. The septic tank soakaway only designed for incoming wastewater and additional increase in flow rate to the septic tank would lead to soakaway failure. My septic tank is failing are there any alternatives solution? Septic tanks are traditional method of wastewater management and often can be talk of the village with problems relating to bad odour, soakaway failure, or polluting nearby watercourse. Do we have alternative? Yes, most common form of replacement is the package sewage treatment plant, they solve bad odour with odourless operation, more efficient soakaway life, and effluent treated to the latest EN12566-3 standard.The effulent can discharge to a watercourse if compliant to the Environment Agency ‘General Binding Rules’. If you need any further advice or our expertise in resolving your septic tank problem, please call us on 01206 89022 or contact us through our website submission form.